PS OLOC distributes a recurring publication connecting old lesbians throughout the Puget Sound area to form community and encourage participation in activities and causes that work to improve our lives and increase our visibility. OLOC is a national network of Old Lesbians over age 60 working to make life better for Old Lesbians through support networks and by confronting ageism in our communities and our country using education and public discourse as primary tools. OLOC is directed by a Steering Committee that publishes a quarterly newsletter, The Reporter, and produces biennial National Gatherings where hundreds of us come together to share experiences and ideas and recharge our energies for the tasks at hand. OLOC encourages Regional Gatherings and local chapters operating independently in their own communities. We love sharing our wisdom, experience, strengths and laughs among ourselves and our communities. PS OLOC also works together for change with other activist and community organizations. TLC is a Puget Sound lesbian, bisexual and transgender organization, in existence since the late ‘70s. The organization provides opportunities for socializing, arranges supportive networking, and promotes education and awareness of lesbian-related issues. TLC publishes a bimonthly newsletter (TLC News and calendar) by email or hard copy, and has a website at www.TacomaLesbianConcern.org. Current annual membership is /year. COWomen is a confidential support and networking (not therapy, but therapeutic) group for women primarily in mid-to-late adulthood: Lesbian, bisexual, transgender and questioning women exploring coming out or “been-out-forever”; new-to-the-area, married (to woman or man) or not, with children (or grands) or not, never been with a women, just lost a partner, starting a relationship, and allies. We gather to listen and share with one another as we talk together as women-loving-women. Our subtitle is AWE: Authenticity, Wholeness, and Empowerment. We value and progress towards: authenticity : being truly who we are; wholeness being all of who we are; empowerment : moving through life as healthy and strong-spirited women. Meeting : 6:30 – 9:00 P.M. on the 1st and 3rd Wednesdays and the last Thursday of each month. PSARA is engaged in a variety of activities and educational work, including the production and distribution of monthly newsletter, The Retiree Advocate. PSARA informs members of various political actions and meetings and invites participation. Aganita Varkentine (of QC3) is on the executive board of PSARA. She also serves on the Diversity Committee representing old lesbians, and she works with the Education Committee. PSARA believes that seniors need and deserve dependable income, comprehensive affordable health care, including prescription drug coverage, access to affordable housing, transportation and social services, support for family care-giving responsibilities and time to relax and enjoy life, family and friends. 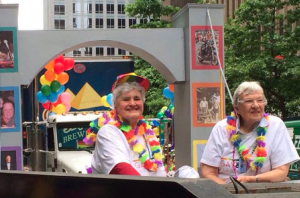 The Northwest LGBT Senior Care Providers is an informal network of senior care providers of all kinds working together to provide advocacy and quality of care for the LGBT seniors of Washington State. It is based on a desire to help educate care providers and health care professionals about the needs in the aging LGBT community. The group meets monthly with guest speakers discussing a wide variety of topics focusing on LGBT elders. Various members of PSOLOC, mainly QCCC members, attend the meetings and offer input. The Providers’ Network sponsors a float in Seattle’s annual Pride Parade, and PSOLOC members are invited to ride on the float. LGBTQ Allyship (Organizing for Social and Economic Justice) is an organization of LGBTQs and Allies who believe that all oppressions are interconnected, and that a world free of oppression is possible. The organization seeks to work in solidarity with marginalized communities to understand the interconnectedness of oppression and to support the systematic liberation of all people. Values fostered are activism, strategies and practices that reflect anti-racism, as well as social justice, compassion, democracy and accountability. ALISS (Aging Lesbians in South Seattle) is a group of older lesbians, most of whom live in the South Seattle area. ALISS meets once a month at the local Senior Center to connect and create community, and in-between for potlucks, games, and other activities as arranged. Meeting : 1st Thursday of Every month at Southeast Seattle Senior Center, 4655 South Holly Street Seattle, WA 98118. The group gathers for lunch at the Senior Center at 12:00 noon. The meeting runs from 12:45 P.M. until 2:45 P.M.
A Seattle social club for lesbians that has met for close to 25 years. There are weekly meetings, with a facilitated discussion, currently every Tuesday night in Northeast Seattle, as well as other outside activities as announced. Seattle PS OLOC, Over 40’s, and ALISS cross-post their activities and welcome one another to each group’s activities. PS OLOC miniNEWS: current and past issues available here. Eversmeyer, Arden, and Margaret Purcell (2010). 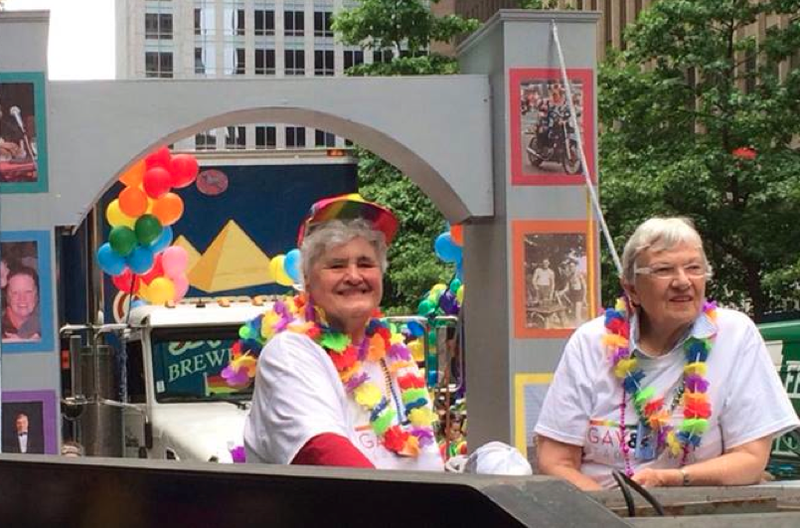 The Gift of Age: Life Stories of Old Lesbians. Eversmeyer, Arden, and Margaret Purcell (2012). Without Apology: Life Stories of Old Lesbians. Faderman, Lillian (2015). The Gay Revolution: The Story of the Struggle. South Sound Lesbians and Seattle Lesbian Social groups on Meetup.com announce many groups and meetings in the Puget Sound area. More than 18 PS OLOC women are deeply engaged in the Old Lesbian Oral Herstory (OLOHP) Project about the lives of lesbians born early in the 1900’s. There is an urgency inherent in the work, as each year women slip away: they die or become unable to give an interview. The stories of women who lived through this unique period in our history need to be preserved, particularly as major changes in societal attitudes take place—such as marriage equality. Also so that these “pioneers” are recognized for their experiences, accomplishments and courage, in a world of compulsory heterosexuality and profound—although unnamed—homophobia and ageism. © Puget Sound Old Lesbians Organizing for Change. All rights reserved.